WBJEE 2019: West Bengal Joint Entrance examination is a state level exam to select candidates for Undergraduate Engineering courses in various engineering institutes and universities in the state of West Bengal. WBJEE is conducted every year by West Bengal Joint Entrance Examination Board (WBJEEB). WBJEE notification 2019 is released and aspirants can fill the WBJEE application form from 16th December 2018. Candidates can submit their applications till 22nd January 2019 by 5 PM. The exam is scheduled for 26th May 2019. In the article below, you will get to know about WBJEE 2019 Notification that is WBJEE Eligibility Criteria, WBJEE Application Form, WBJEE Syllabus, WBJEE Exam Dates, WBJEE Admit Card and all the important events as per WBJEE notification, 2019. Read below to find out. Subjects (Mandatory) Physics and Mathematics in class 12th exam. Subjects (Optional) Studied either Biology/ Chemistry/ Biotechnology/Computer Science/ Computer Application. Step 1: Visit the official website of WBJEE: wbjeeb.nic.in. Step 3: Login with the following details. Step 4: Click on “Submit” and Application Number and Password will be generated. Step 5: Login with your credentials and enter your personal, academic and other details like the preference of exam cities, etc. Step 6: Upload scanned copies of your Photograph and Signature. Step 7: After uploading the image and signature successfully, a candidate will be directed to the application fee payment page. Make payment of the WBJEE application form fee. Step 8: Submit your WBJEE 2019 application form. Step 9: You will be led to the confirmation page. Candidate can download the confirmation page and save it for future reference. Candidates appearing for WBJEE, 2019 should be aware of the fact that 0.25 marks will be deducted for every wrong answer for questions belonging to Category 1 and 2. There will not be any negative marks for wrong answers for questions from Category 3. WBJEE Admit card will be released on 14th May 2019. Candidates who have successfully submitted their WBJEE 2019 application form and made payment of fees can download their WBJEE hall ticket from the official website of WBJEEB. All the candidates need to carry the hard copy of WBJEE 2019 admit card at the time of appearing for WBJEE exam 2019. Otherwise, they will not be allowed to appear for the exam. Note that candidates will be able to download by logging in to their account with the credentials generated at the time of registration. WBJEEB will release the provisional WBJEE answer key after successful completion of the WBJEE 2019. Candidates will be able to challenge the provisional answer key by paying a fee of Rs 500. The board will make the necessary changes in the answer key after evaluating the challenges submitted by the candidates. After the detailed analysis, the final answer key will be uploaded on the official website. Candidates will be able to check their WBJEE Result in most likely on 2nd July 2019. A General Merit Rank (GMR) will be compiled and released by WBJEE Board and accordingly, students will be called for WBJEE counselling. In the counselling process, candidates will be allocated seats based on their merit, preference and availability of seats. We hope that this article answers all the possible questions related to WBJEE 2019 Notification. Now, you should go through the WBJEE 2019 exam pattern, WBJEE syllabus and start your preparation. Finish the entire syllabus in the most effective manner. Solve as many WBJEE practice questions and previous year questions as possible. Since the syllabus for WBJEE is almost the same as that of JEE Main, you can solve JEE Main practice questions and take JEE Main mock tests for free on Embibe. This will ensure you clear WBJEE 2019 without any difficulty. We hope the detailed article on WBJEE 2019 Notification is helpful. 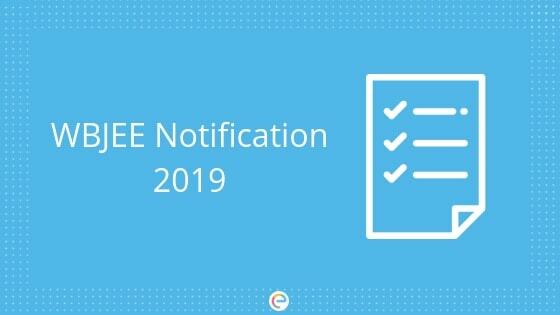 In case you have any query related to WBJEE 2019 Notification, you can drop down the same in the comment section below and we will be happy to help you.